Federal Court Backs Calif. Ban On Conversion Therapy For Minors : The Two-Way California's pioneering law that prohibits treating young gay people with psychotherapy in an attempt to change their sexual orientation has cleared a constitutional challenge in federal appeals court. The law was put on hold after its opponents won an injunction last December. A federal appeals court has reversed an injunction that kept California's law banning conversion therapy from taking effect. 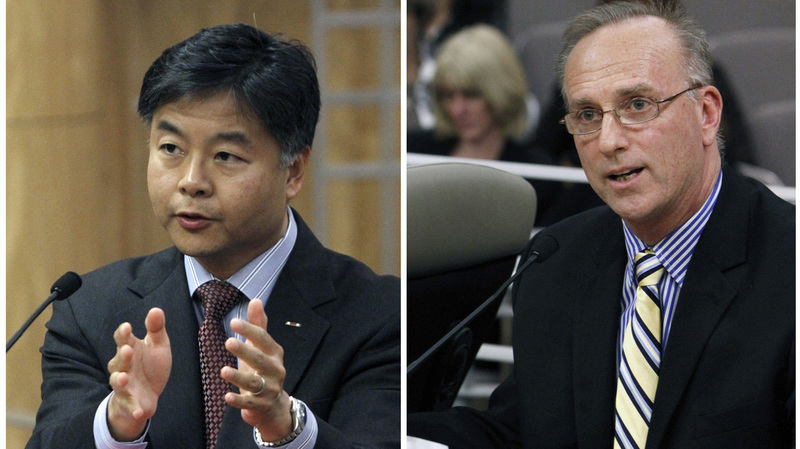 This composite image shows sate Sen. Ted Lieu, left, who introduced the original bill, and David Pickup, a marriage and family therapist who is a plaintiff in the suit against it. California's pioneering law that prohibits treating young gay people with psychotherapy in an attempt to change their sexual orientation has cleared a constitutional challenge in federal appeals court. The 9th U.S. Circuit Court of Appeals in San Francisco ruled that the ban does not violate essential rights. The law, which was to take effect in January, had been on hold after its opponents won an injunction last December. It bans mental health providers from treating minors with conversion therapy. The injunction against it has now been reversed. Conversion therapy advocate David Pickup and others, including the group the National Association for Research and Therapy of Homosexuality, or NARTH, argued that the ban limits free speech and violates the rights of potential patients and their parents, as well as counselors. But in a unanimous ruling, the appeals court panel rejected that argument, saying that the bill seeks to regulate "professional conduct, not speech." The panel of judges also said that the evidence in the case showed that the California legislature "acted rationally when it decided to protect the well-being of minors by prohibiting mental health providers from using 'sexual orientation change efforts' on persons under 18." Their opinion later notes, "Parents have a constitutionally protected right to make decisions regarding the care, custody, and control of their children, but that right is 'not without limitations.'" As NPR's Alix Spiegel has reported, "debate about the value of conversion therapy, also known as reparative therapy, has been raging in psychological circles for more than a decade." A similar measure in New Jersey was recently signed into law by Gov. Chris Christie, as Eyder reported last week.